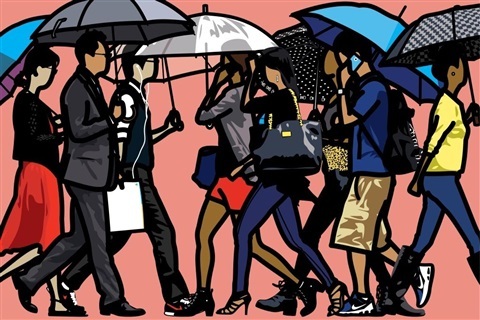 Julian Opie's distinctive reductive style draws from diverse influences including billboards, classical portraiture and sculpture, dance, Japanese woodblocks, and cartoons. His work comprises silhouettes, animations, LED animations, and simplified portraits and landscapes. Employing a variety of media and technologies to make "paintings" of his subjects, Opie distills everyday images and experiences into concise but evocative signs and pictograms.